The Swei lab employs empirical field approaches, molecular and genomic analyses, and quantitative modeling to understand and predict the interactions of microbes and pathogens in a community ecology framework. 3/2/19 - Dr. Swei was a keynote speaker at the inaugural Bay Area Ecology and Evolution of Infectious Diseases meeting held at Stanford University. 11/17/18 - Congratulations to NIH Bridges fellow, Adrian Barrera-Velasquez, who presented his summer research on Borrelia miyamotoi ecology at the Annual Biomedical Research Conference for Minority Students (ABRCMS) meeting in Indianapolis, IN. KQED Deep Look visited the Swei Lab to understand how a tick bite works. Check out the video below. Ixodes pacificus nymphal ticks are the primary vector of Lyme disease in western North America. 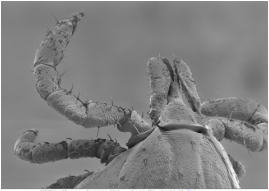 This EM image shows the piercing mouthparts that this tick uses to attach and feed on its hosts. 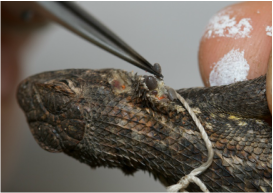 This western fence lizard is being checked for for juvenile ticks to better understand the role of habitat fragmentation on tick burdens and disease transmission in Californian habitats. 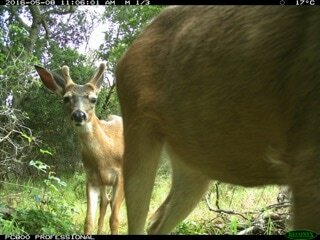 These black tailed deer came to investigate our wildlife cameras. Motion sensor cameras across a habitat fragmentation gradient document species richness and relative abundance.